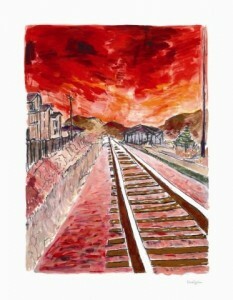 Artica Galleries, part of the Castle Galleries group is selling limited edition prints of Bob Dylan’s ‘Train Tracks’ from the ‘Drawn Blank’ series. There are 295 lithographs of the originals. One original sold for £450,000, according to the gallery assistant. Each signed lithograph is upwards of £2,000 but an investment. The red and blue images are sold out already, but there are others. They are quite lovely too.